Keep those criminals at bay with this deluxe police baton accessory. This baton is made of durable plastic and is completely black. 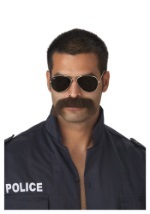 It has two handles on one end and makes a great addition to any of our police officer costumes.